Preheat your oven to 400ºF and spray a deep dish with cooking oil. In a large skillet, heat the oil over medium heat and cook the onions until they begin to soften. Add the ground beef to the onions and cook until the beef is browned. Drain out the fat from the beef and stir in the garlic and tomato paste. Cook the mixture for a full minute over medium heat and add the black beans and corn. Then add the beef broth, cumin, oregano, chili powder, cayenne, brown sugar, and some salt (however much you prefer). Reduce the heat and simmer everything until most of the liquid has reduced. 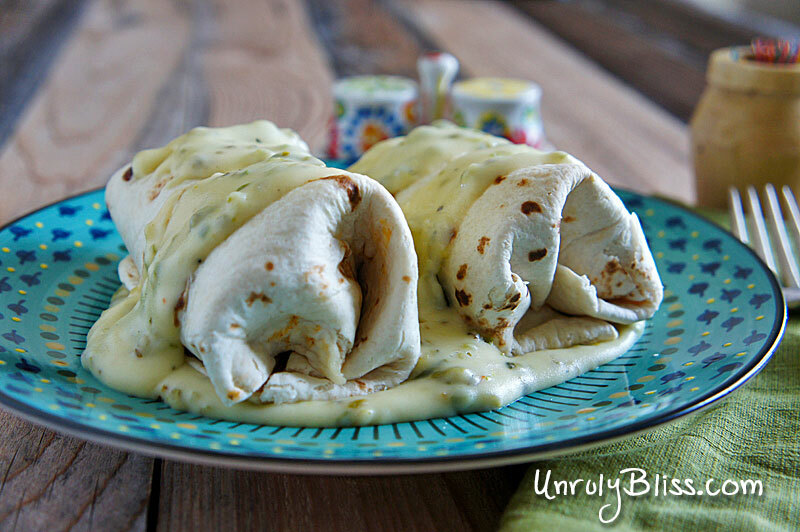 Lay all of your tortillas out on a flat surface. Place a good pinch of pepper jack cheese in the center of each one and then evenly spoon a good amount of beef mixture on top. 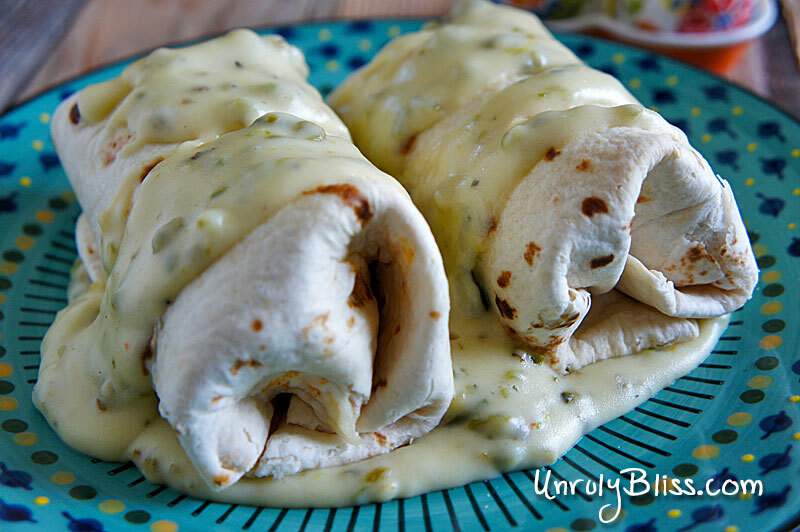 Depending on the size of your tortilla (we seem to use a different size every time we make these), either roll your burritos up or fold in all of the sides like an envelope. Place each one into your deep dish with its seem facing down. Spray the tops of the burrito with cooking spray (this helps them get crispy) and bake them for 20 minutes (or until they look golden brown). 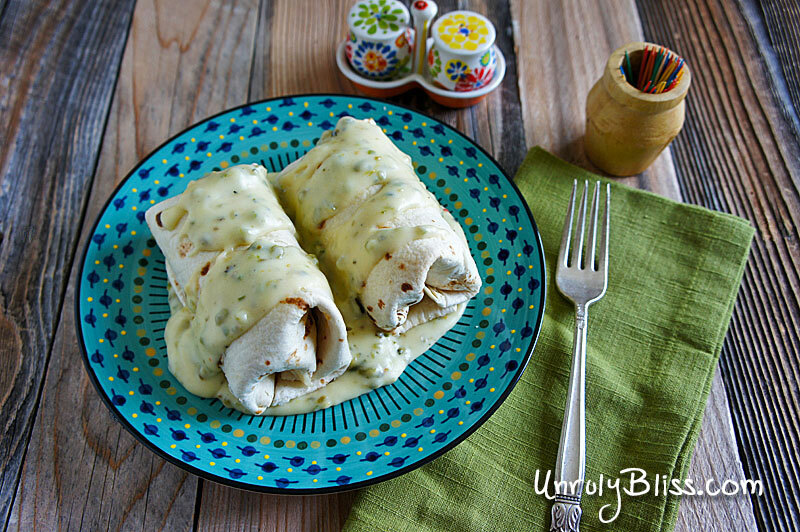 While your burritos are baking, start the poblano queso sauce. 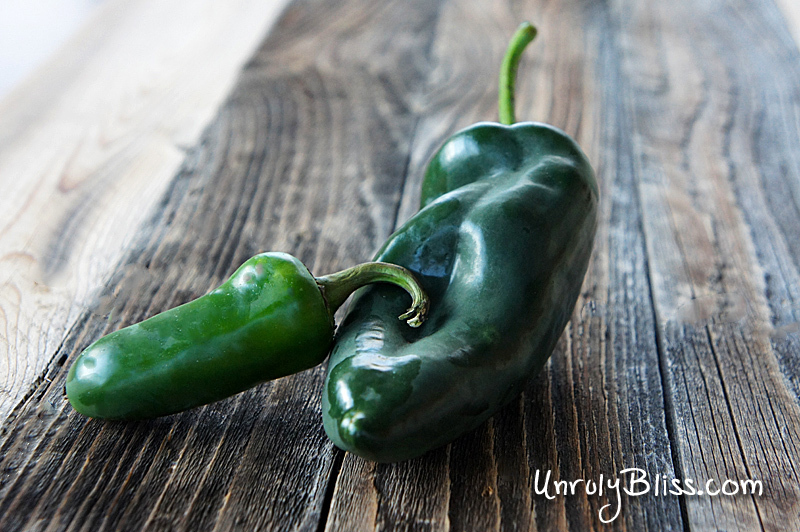 Char the poblano pepper by placing it directly over a gas burner or on a hot grill. Repeatedly turn the pepper over until the skin is charred and blackened on all sides. Place the charred pepper in a sealed container so that the heat and moisture force the skin to become loose. Once it has cooled, peel the pepper, remove the stem and seeds, and dice it small. Heat a sauce pan over medium heat and add the butter. Saute the diced jalapeno and poblano pepper together for about two minutes. Add in the flour while vigorously stirring the mixture. It should form a gummy paste like substance with small chunks of peppers in it. Slowly add milk and continue to stir the mixture until it becomes smooth. Add in the cheese and continue to stir it until the cheese melts and the sauce thickens. Stir in the plain Greek yogurt and then season your sauce with salt and pepper (however much you prefer). 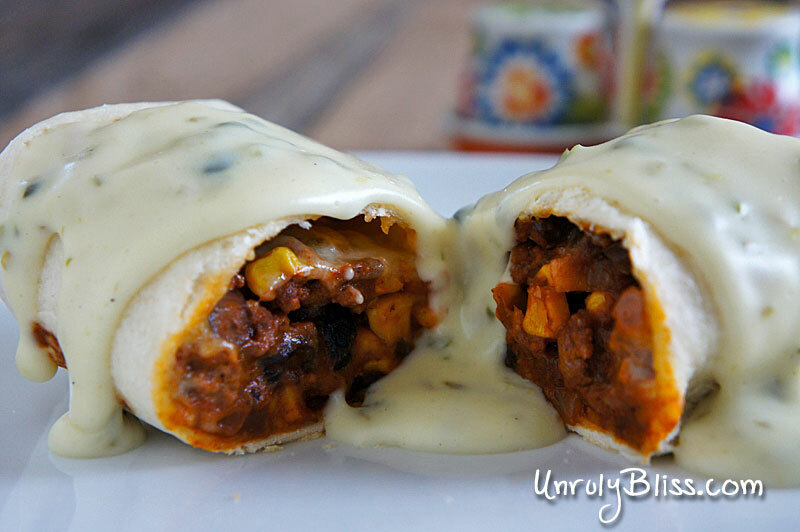 Pour the sauce over the baked burritos and enjoy!